Somaly Mam Foundation Nonprofit retreat for the staff. Yup, one of our agenda items happened at the beach. Very windy beach. Hair gives it away. I’m sure we did constructive things – there must have been goals and objectives and agenda items that helped to propel our work forward. But there’s only thing I can really remember clearly. Or at least somewhat clearly. Night golf. Each senior executive wearing a headlamp. Glow in the dark golf balls. A different themed bar just past each green. Pretty sure this was the team building exercise. 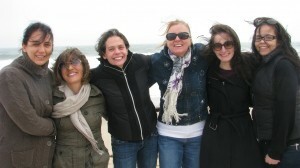 It was also my sole experience with staff retreats before diving into the nonprofit sector. So, is there any difference between corporate and nonprofit retreats? Can you have an effective nonprofit retreat without the purchase of headlamps? What makes an effective nonprofit retreat anyway? And as a board chair or E.D., what should your role look like to maximize candor and productivity? Before we go any further, there seems to be a trend to call nonprofit retreats an “advance.” I guess the idea is that the gathering is in the service of “advancing” the work. A retreat is a retreat. Check the dictionary. A period of withdrawal for meditation and/or study. So first things first. Recognize it for what it is. An opportunity to step away from the day-to-day, business as usual. A chance to exhale, to consider your work, your goals, your future outside the office with your cell phones off (except for breaks). To make the time you never have to consider the issues that actually deserve the most time of all. The focus on the important rather than the urgent. The retreat must be owned by its participants. A top down approach is a recipe for failure. If YOU want to have a retreat because YOU think that the group should be discussing what YOU want, re-think and re-frame. When a group has a shared investment in the goals and outcomes, you all win. Hire a facilitator who doesn’t simply direct traffic and keep the “queue.” I always joke with my clients that if I have one weakness as a facilitator, it’s keeping the queue. I’m too busy listening, capturing ideas, synthesizing, and helping to clarify the important points people are trying to make. You are hiring someone who is outside of your process; be sure that this person is smart, strategic and is a first rate listener. That is how you take fullest advantage of the objective point of view. Oh, one more thing. Hire a facilitator who is not afraid of being honest with the head honcho. This will be key in prepping her/him and in debriefing as well. Reach out to every single retreat participant for input. Ask each participant to answer a single question like, “This retreat will be a success for me if _________________,” and send the responses to your facilitator. This gets you important information and buy-in. Review participant feedback with E.D. or Board Chair. What do you all see? What are the trends? It is through the lens of this feedback that retreat goals should be set. A nonprofit retreat agenda is not simply a collection of agenda items. It must have an overriding purpose or theme. The best retreats take participants on a journey. Agenda item B builds on item A and so on. Identify a space that comes as close to ‘pampering’ as possible. If ‘pampering’ is unattainable, shoot for comfortable. A donor’s house maybe? Something other than a conference room and definitely out of the office, if you can swing it. Never ever put the word “icebreaker” on the agenda. You’ll regret it. People hate them and cringe when they see the word. Now that doesn’t mean you shouldn’t do them. Of course you should. Just be sneaky about them, build them in organically, or just call them something else. Here’s my recipe for the perfect ice breaker. Shoot for agenda quality over quantity. Are you bringing overworked, stressed-out staff members to a retreat with so many agenda items that it makes staff members feel overworked and stressed out? Fail. A breathless pace to a retreat is a waste of time and money. Divide your day into large blocks. Focus on the most important big things. Debrief ASAP. Your facilitator should provide you a summary of evaluations within one business week following the retreat along with flip chart transcriptions and any other analyses the facilitator was charged with. Last, but perhaps most importantly, the agenda for this debrief is not simply a self- congratulatory job well done. It must include a plan for implementation that includes quarterly extended meetings that enable the attendees to review action items and assess results. An important ingredient that can lead to transformation. OK, I got this, I said to myself. I’ll talk about my really cool baseball card collection from the 1960s. I so didn’t get it. First up. Staff member Kim. She announces that she is about to transition and would like to be known as Nick. Another spoke about some family trauma; another talked about being intersex. Before I knew it, the 20 people in the room were all crying. I started to tear up. What would I say that could match the passion of my staff? Baseball cards? But then I really got it. I realized that the execution of a mission demands passion and that this passion manifests itself in strong emotions, sometimes conflict (which is why I am now a certified mediator) and yup, tears. So pack yourself a good facilitator, a passionate tribe of staff members, a clear set of goals and get out of your office for an effective retreat. And don’t forget the Kleenex. P.S. There’s a ton more on this website about becoming a great Executive Director. Please explore!